Indian wrestler Sakshi Malik shared an epic photo moment with PV Sindhu and legend Gopichand on last day of Rio Olympics 2016. Both the ladies have brought glory to India with a silver and bronze medal. While this edition has not been as good has London in 2012, two medals in one week have boosted the country. 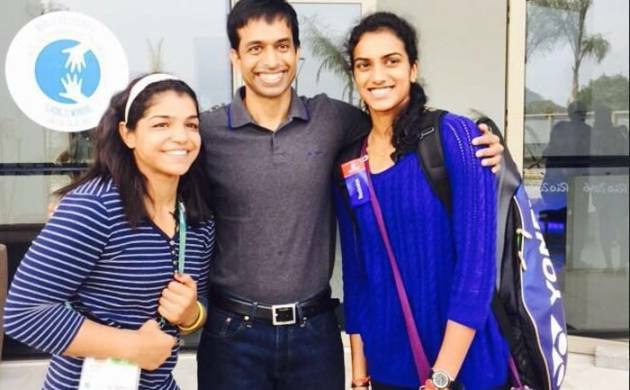 Sakshi Malik captioned the image as "Ran into the super awesome @Pvsindhu1 and the Legend P Gopichand! True Champions!" Pullela Gopichand, who is being praised for both putting efforts in lifting Sindhu as well as badminton fraternity, can be seen sharing the frame with the two champions.